Wanda… Wanda is a beautiful Streamline Countess who came to us all the way from Perrysville Ohio. She was in a sad unloved state and is our biggest renovation, but oh so worth it! Streamline’s are extremely rare in the UK, we are only aware of two others! Based in Thornton Indiana, the Streamline company only existed for 17 years. Our Wanda was born in 1963 and spent all her life in Ohio. 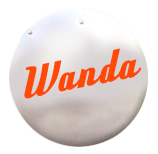 When we received the title and saw a previous owner had been called Wanda we instantly knew we would never find a better name for her so Wanda it was. With her distinctive gold stripe Wanda is certainly eye catching. She’s a 4 berth trailer with a double bed in her sleeping section and an awesome turquoise vinyl dinette that makes another double. She has plenty of wardrobe space, turquoise and pink curtains, a fabulous original pink sink and a pink and grey checkerboard floor. She is a thing of rare beauty!